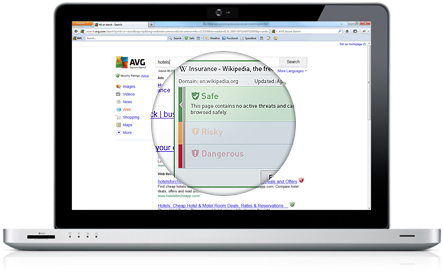 AVG Secure Search alerts you before you visit dangerous webpages to make sure your identity, personal information, and computer are protected. In addition, our integrated AVG Do Not Track brings the control over your privacy back to you. 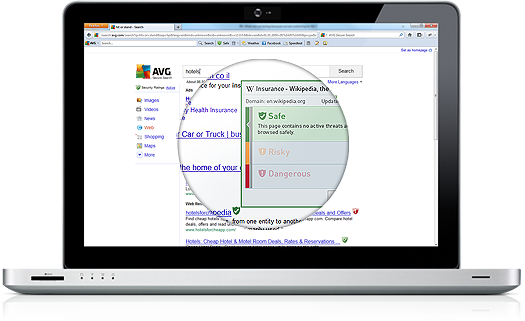 AVG Secure Search provides an additional security layer while searching and surfing to protect you from infected websites. 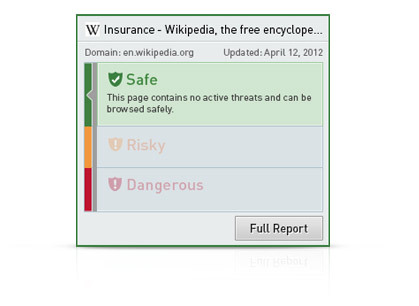 It checks every link you click to make sure your identity, personal information and PC are protected. It also protects you when you enter a web address directly into your browser, when you click links on search engines or social networking sites, and when a program or application opens your web browser. AVG Do Not Track lets you identify which websites are collecting data on your online activities and gives you the option of allowing it or not. Know which websites collect information on your browsing habits and decide if you wish to be tracked or not. AVG Do Not Track helps you identify and block ad networks, social buttons, and web analytics that might track your activity. In addition, you can also choose to notify those websites about your preference not to be tracked. An icon in the AVG Security toolbar alerts you if websites or advertisers are tracking your activity on the page you are visiting. 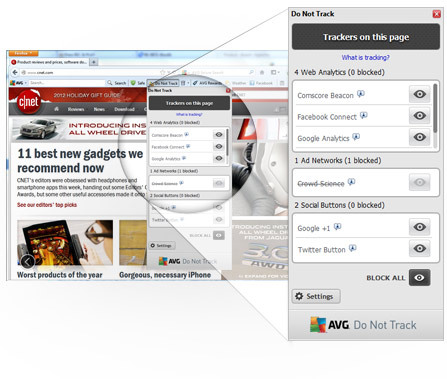 Click on the AVG Do Not Track icon to see which trackers are active on the page you are visiting. Block services that you don’t want tracking your online activity by clicking on the eye symbol ( ). Helps you to quickly access what you are looking for. Alongside the search box, you’ll find other useful features giving you essential information without cluttering your browser. 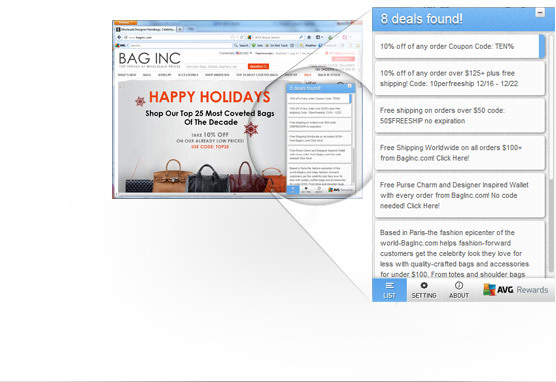 In addition, our integrated AVG Rewards help you discover great online shopping deals. AVG Rewards helps you discover some of the best deals and lowest prices when you shop online. It saves you time and money by scouring the internet to provide you with all the relevant deals and offers from your favorite online retailers.